After 14 months of group discussions, business planning, and contract proposals, Reliable Controls® Corporation signed its first ever distribution agreement. 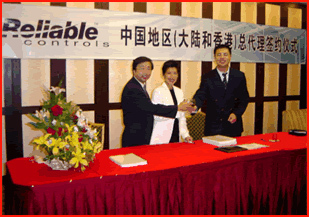 On September 17, 2003, Shenzhen Reliable Controls Corporation became the exclusive distributor for Reliable Controls® products in all of Mainland China and Hong Kong. Mr. James Bian (right) will manage the new distribution company. Julianna Yu (centre) and Cary Yan (left) traveled to China, visited the new operation, and participated in a formal signing ceremony (seen above). Reliable Controls wishes to thank all the individuals who have worked hard to make this opportunity a reality. We wish to especially thank Mr. Dave Webb, of Webir Automation, who took the initiative of employing James Bian, in 2001, to work as a controls engineer for over a year. During his tenure with Webir Automation, James confirmed to himself that Reliable Controls was indeed the product he needed to bring back to China for distribution. We welcome James Bian and Shenzhen Reliable Controls Corporation to our international distribution network and look forward to many years of positive activity in China and Hong Kong.